A team of four talented art students from St Michael's College have had their poster on the treatment of asylum seekers put on display at the University of South Australia to mark Refugee Week. 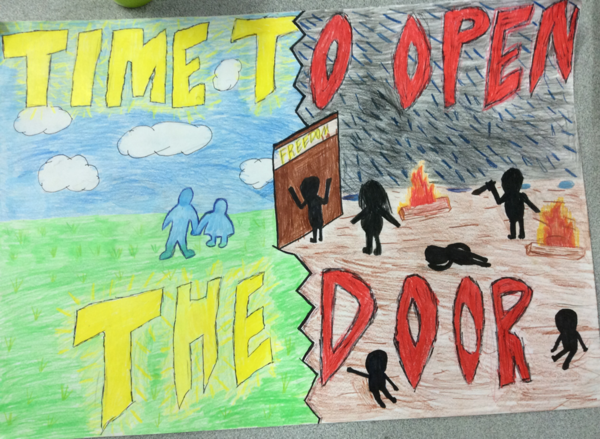 Year 6B students Alexander Karnas, Jamil Abu Hassan, Will Schubert and Finn Higham were finalists in the Youth Poster Awards Competition for their work entitled " Time to Open The Door". Each year, primary and secondary students in South Australia are invited, through their schools, to produce a poster that celebrates the themes surrounding the United Nations International Refugee Convention. These themes include multiculturalism, human rights, cultural diversity, anti-racism and the welcoming of refugees into Australia. The St Michael's students' poster powerfully contrasts living conditions inside and outside immigration detention centres. The students and their teacher, Ms Kate Tyrwhitt, attended the opening of the exhibition at the Kerry Packer Civic Gallery in the Bob Hawke Prime Ministerial Centre at the university. Ms Tyrwhitt said it was a great opportunity for the students to convey their empathy towards refugees and asylum seekers through their artwork. The exhibition will run until Friday 1 July.